We have just completed a survey to assess the expected impact of Brexit on late payments within the UK. Our findings are quite frightening as they suggest that the majority of businesses, more than 83%, are expecting their customers to take longer to pay as a result of the economic impact of Brexit. It was particularly striking to find that not a single company expected the current situation to improve as a result of Brexit. A UK-wide referendum was held on the 23rd June 2016 where 51.9% voted for the UK to leave the European Union (EU). On the 29th March 2017, the UK Government led by Prime Minister, Theresa May, triggered Article 50 of the Treaty on the European Union. This action started a 2 year process, as a result of which, the UK will leave the EU in March 2019. The process involves extensive negotiations about the terms of the separation, and in view of this extended period there has been much uncertainty created about about the economic impact of Britain's exit from the EU. In the last few days, the IMF (International Monetary Fund) have reduced UK annual GDP growth forecasts to 1.7% for 2017, citing the uncertainties around Brexit as a key driver of this decision. 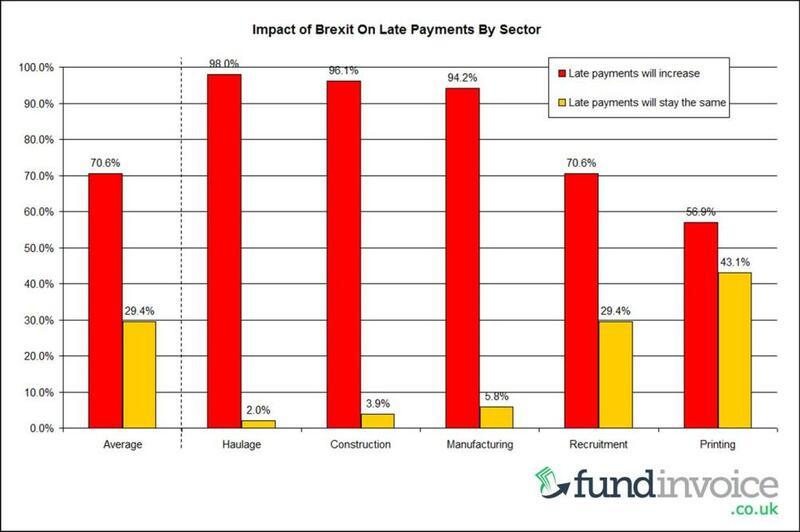 At FundInvoice we have conducted our own UK late payment survey in order to understand the effects that Brexit is expected to have on this aspect of the UK economy. Construction companies - 51 respondents. "How do you think Brexit will affect the time that your customers take to pay?". Respondents were asked to indicated whether they expected the number of instances of late payment to increase, decrease or to stay the same. We then calculated average responses overall, and by sector. The anticipated impact of Brexit is that the majority of businesses expect that customers will take longer to pay, with instances of late payment increasing. No one expected an improvement. The effects anticipated were subject to a quite dramatic shift, according to the industry sector of the party that we were speaking to. As you can see, the graph reflects a significant swing in opinions between different sectors. The haulage and construction sectors were anticipating the greatest impact as a result of Brexit, closely followed by manufacturing. In these sectors,there was an overwhelming expectation that there would be slow down in debtor payments. Recruiters expected a much lesser effect - but nonetheless a significant slowdown in customer payments. The recruitment agencies that we spoke to indicated that the impact on their sector would be 28% less than than on the haulage sector. Despite this, there were still more than 70% of those questioned in this sector that were expecting a deterioration in conditions. Finally, the printing sector expected to be the least affected, but still anticipated a slow down in the majority of cases. The feedback indicated that the impact of the printing sector would be 42% less than that on the haulage sector. It may also be worth noting that extended credit terms are often already taken in the print sector, it may be that terms are already stretched, hence the anticipated future impact is less. However our survey did not address this particular detail. In addition to recent late payment legislation to give businesses the right to charge interest on overdue debts, the Government has also introduced legislation requiring large companies to report and publish their payment practices twice a year, including the average time that they take to pay their suppliers, many of whom are small businesses. The hope is that this type of public scrutiny will encourage large businesses to pay their small suppliers more quickly. The degree of influence that this has remains to be seen. The other issue is of course smaller businesses paying late. In some cases even the threat of a few months overdue interest may be seen as a cheap option to take the extra extended credit that they need. Some action has been taken by the Government, to try and tackle UK late payment culture. For example the introduction of legislation to enable the charging of statutory interest on overdue debts as a right. However, this does not seem to have had a huge impact on the problem. The Atradius payment practices barometer from Spring 2016, suggested that 44.3% of B2B sales in the UK were on credit terms. 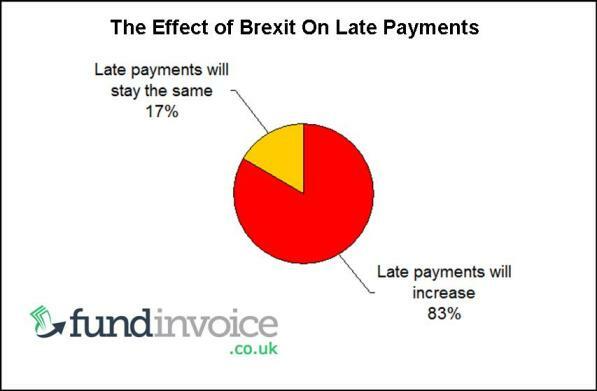 Apparently 90% of British businesses had experienced late payments during the last year. Against average credit given, the average time to receive cash from a credit invoice was 52 days, with delays being largely due to liquidity constraints. The Atradius survey found that the B2B customers in the construction sector were the slowest payers. Our research suggests that this position is likely to deteriorate further in the run up to the UK leaving the EU. What Can You Do About Delinquent Payments? Give Someone Else The Problem - yes, that really is a possibility using what we is called non recourse factoring. Factoring companies are able to handle your credit control for you, they will give you 70-95% of your invoice value immediately that you raise it. If you also go for a non recourse option, it includes bad debt protection so that if a debt is not paid, you get the balance (less their charges) after an agreed period of time. Providing you trade within specified customer credit limits, that the factoring company sets, your invoices are covered against bad debts. Using this type of service, you can give the whole problem to someone else. Interestingly, in one of our surveys of existing users of this type of cash flow finance, 96% told us that greater use of invoice finance would improve the UK's late payment culture. Good Credit Control - the most obvious solution, if you want to manage the situation yourself, is to have robust credit control procedures in place. This will not only deal with debts once they become overdue, but it will also involve setting reasonable credit limits for customers, so that the amount of credit taken does not get out of hand. If the customer abuses that credit period, it can be taken away, but suppliers often fear losing the business, which deters them from taking the tough decisions. It will also need to set out a process for taking pre-legal and legal action should your conventional collection methods not prove effective. Our free credit control "how to" guide is full of helpful advice about setting up your own procedures. A key facet of your procedure should be having clear written terms, a clear statement on the invoice of when it is due, and understanding how the customer's payment cycle and practices work. For example, they may make their payment run on a certain day of the month, in which case you need to check that your invoices are in the process prior to that date. Remember that you don't have to offer the same credit terms to all your customers. If you have concerns about a particular customer you could require them to pay cash terms, take a deposit or you might shorten the credit period that you offer them. Just sending your invoices electronically may help speed up the process. According to Graydon's, only 35% of small businesses email their invoices, with the majority missing the opportunity to have a clear email trail showing that the invoice has been sent and received by the debtor. Emailing also makes sending a copy invoice much quicker, if required. Some large organisations, such as RBS, use specialist supplier payment systems that you need to be able to incorporate into your processes, in order to get paid. It will not work to just send your invoices in these cases. Understanding the payment process within any customer's organisation is essential at the outset of the relationship. Deal With Delinquent Payment Excuses - part of the process of good credit control is dealing with payment excuses given by customers. We have put together a library of excuses that we have come across, and some advice about how to overcome common late payment excuses. They may not be a guarantee for successfully getting paid, but a methodical, regimented approach to following up is the method that is most likely to lead to success. Ensuring that you get any work or deliveries signed off by the customer, is another important step in minimising the problems that you can face in trying to get paid. It will be harder for the debtor to raise a dispute if they have already signed a satisfaction note for the work undertaken, or a proof of delivery for goods that you have supplied to them. Charge A Late Payment Fee - there are links to the Government site, which sets out how statutory interest on late payments works, below. However, you can include a late payment fee in your terms with the customer and you can also charge interest on late payments (note that in adding this to your terms, you may not be able to charge statutory interest etc.). At the time of writing, the overdue interest could be charged at 8% above base rate but see the link about statutory interest below for the latest figures. This is an example of how overdue interest is calculated. If you have a debt of say £10,000 and you charge at say 8% over base rate of 0.75%, that is 8.75% per annum charged. This would be £875 charged per annum. It can then be annualised i.e. £875 divided by 365 days. This is just under £2.40 per day. So if the debt were paid 50 days late, the interest due would be £120. You may also be able to make a debt recovery charge of £100 on a sum of this size, but again see the Government guidelines on statutory interest for the latest figures. Offer Payment Incentives - taking a more positive approach to the issue, you might consider offering an early payment incentive, also known as dynamic discounting. This involves offering an early payment settlement discount, in return for prompt payment. However, be careful as customers will sometimes deduct the discount despite the fact that they paylate. You could end up in a battle to recover a small fraction of what you were owed, which may not be cost effective - and may lead to you writing it off as too small to be worth pursuing. Professional Credit Control Services - if you don't want to receive any finance against your unpaid sales ledger, you can still consider using the services of a professional credit control agency. Many companies use an outsourced credit control service to do the invoice collection for them. It removes the need for them to maintain an in-house credit control team or to use the time of their owners / managers to chase payments rather than running the business. There can be a significant cost saving to be achieved by using a fraction of a centralised team of collectors, rather than having to employ your own team of staff to carry out the function. Also, employing staff comes with numerous other obligations that do not apply if you are using an external provider to supply the services. Many customers find that this approach of using an outsourcer also delivers an improved debt turn (the speed with which debts are paid), beyond what they had been able to achieve themselves. Funding The Credit Gap - you may not want to have someone else running your debtor collection, but you may occasionally want to get the money immediately for an outstanding invoice (or fund against an application for payment in the construction sector). There are selective invoice financing services that enable you to pick and choose invoices to get funding against. You can access that funding without a credit control service if you wish. This can bridge the credit gap between sending your invoice and receiving payment from the debtor. These services often don't have any contractual obligation placed on you to ever use the service again. This gives you total flexibility to use the funding only when you have a peak cash flow requirement. It can be reassuring to know that you have such an arrangement in place, in case you need to call on it if outstanding debtor payments start to build up. Cash Payments - you could take the easiest option, and stop giving your customers credit. If all your customers paid cash terms you wouldn't have any worries about not getting paid. However, the commercial pressures then come into play. In sectors where it is usual to offer a credit period, you not offering credit will then compare badly with your competitors that are prepared to offer credit terms. People may also respond negatively to a change in their terms, having been granted credit it the past, it may be perceived negatively if you then remove that option. If you are not comfortable with the idea of not offering customers credit, you might choose a halfway house approach. For example, you might request a deposit of say 50% of the order value prior to shipment, with the balance paid on credit terms. Maintain Relationships - whether it's with the payments clerk at your customer's head office, or with your contacts generally at their organisation, keeping good relations with your customers can only help you resolve any payment problems. If you are having trouble with an invoice you may be able to speak to a contact in another department, who may have internal contacts that they can leverage to help you get paid. Often the people responsible for buying are keen to ensure that their suppliers are paid on time, in order to foster good relations. Offer Factoring To Debtors - it is common for factoring companies to recruit new clients when speaking to the customers of their clients. You could use the same approach for your debtors. If they are having liquidity problems, you could recommend them to a factoring company in order to improve their cash flow, and improve the flow of payments to your company. This effectively shifts the problem away from your business. Rather than you offering them a free credit facility by way of allowing them to take extended periods to pay, their factoring company will provide the funding and any associated cost is for their account. So whilst our results suggest that UK businesses are set to experience a slowdown in customer payments, there are plenty of simple steps that you can consider to try and mitigate or alleviate the problem of late payments. Article - How to protect your business against the effects of Brexit.